The popular, busy and vibrant atmosphere at Underwater Vision, Utila makes for an ideal setting to begin your adventure into the professional levels of scuba diving. Working closely with our staff of highly trained PADI Professionals, including award-winning PADI Course Director Diego Frank in this intensive internship program you will expand your dive knowledge and enhance your diving skills to attain a professional standing. The PADI Divemaster internship training develops your leadership abilities, qualifying you to supervise dive activities such as leading certified fun divers and assisting instructors with student divers on PADI recreational scuba diving courses. Our dedicated staff of dive professionals are available to you as mentors throughout your internship for one-on-one assistance and to offer tutorials to guarantee your success. 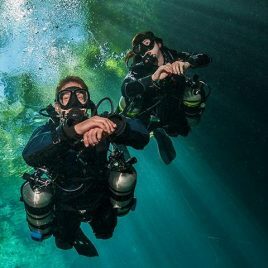 PADI Divemaster is the prerequisite certification for both the PADI Assistant Instructor Course and PADI Open Water Scuba Instructor certifications. BOOK NOW and reserve your place on the team! Achieving the PADI Divemaster Level of training gives you the opportunity to work as a Scuba Diving professional. 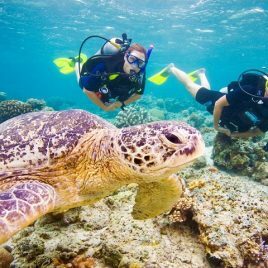 What a fantastic way to pay for your travels around the world, stopping to work and live in various diving communities, getting to know the culture, the people and the marine environment! Also, it opens the door to further dive education. Once you have reached the Divemaster Level, you are able to further your professional career and take the steps toward becoming a PADI Open Water Scuba Instructor and beyond! The DMT (Divemaster Training) course at Underwater Vision is an excellent place to do your training. 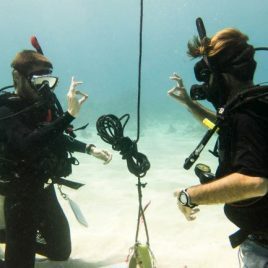 The highly experienced staff, are all available to guide you successfully through the program, using group study, practical experience, independent study and one-on-one tutoring to ensure you gain the knowledge, real experience and confidence you need to complete the internship and to become gainfully employed in the industry as a Dive Professional. 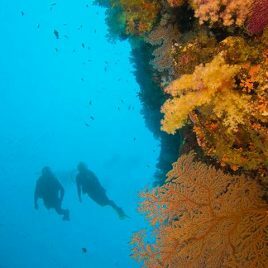 Divemasters in Training are given many opportunities to improve upon their own diving skills through real life experience: working with students and top-notch instructors in supervised open water and confined settings. 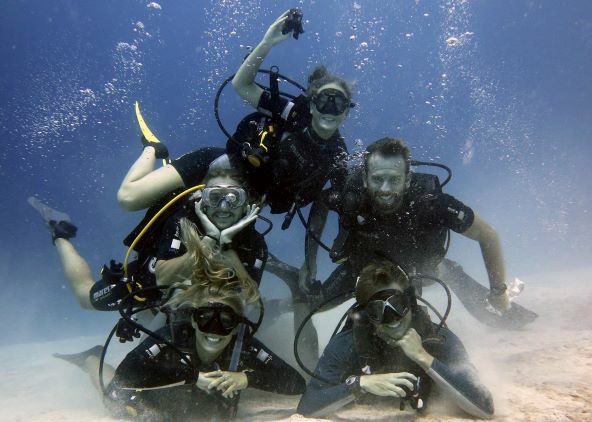 Read a Blog Posting by one of our PADI Divemasters In Training about their positive experience with the DMT Internship Program at Underwater Vision! Underwater Vision is a busy dive operation with dive boats going out three times a day. Two tank dives each morning and afternoon, and one night dive per day. Therefore, there are many occasions for you to increase your number of dives and experiences as a DMT. Utila is a vibrant dive community. Many people from different cultures converge here to learn to dive and to further their diving training. Utila is one of the best places in the world to train as a dive professional. You will meet other DMTs and dive professionals who, like you, love the sea, the marine environment, coastal living and a laid back Caribbean community and most of all, diving! Friends for life are met during the DMT internship and Underwater Vision is a location absolutely conducive to socializing and enjoying time spent on land! Please Contact us for information on affordable accommodation options available in Utila for our Divemasters in Training. The DMT Internship can be completed in a very busy two week period, or a comfortable one month or more stint. We are able to cater to your time constraints. 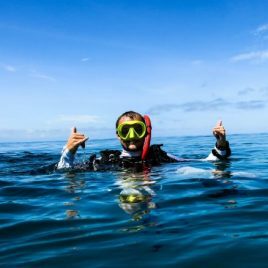 You will work with our PADI Silver Rated Course Director Diego Frank to personalize your schedule. I enjoyed my DMT at Underwater Vision as well as my work as a Divemaster so much that I am continuing my education to become a PADI Open Water Scuba Instructor, and have enrolled at the IDC at Underwater Vision! Diving has changed my life and I want to continue down this career path, instilling my passion for diving onto others and making a living doing something that I LOVE! What an amazing experience I had at UWV doing my DMT! The diving was spectacular, the instruction was amazing and the people I met from around the world, I still keep in contact with today! I am currently employed in the Maldives as a Divemaster and wouldn’t trade my life for anything! Thank-you UWV for making my dream come true! You may be able to get college credit for the Divemaster course while you are on Utila beginning your professional scuba diver training and having the time of your life! Sign up for eLearning for Divemaster – PADI’s eLearning option – to start now. You can work through eight knowledge development sections using a web-based system that lets you learn at your own pace. You also have access to an online version of the Divemaster Manual for reference during and after the course. Another option is to study by reading the Divemaster Manual and watching the Divemaster Video (a book and DVD package). Visit Underwater Vision to enroll in the course and get your Divemaster Crew-Pak, which also includes other reference materials – like the PADI Instructor Manual and The Encyclopedia of Recreational Diving – that you’ll need during the course. Consider taking eLearning for Dive Theory Online, another PADI eLearning program, that takes you step-by-step through dive physics, physiology, skills, equipment and environment, plus a Recreational Dive Planner (RDP) review. By successfully completing eLearning for Dive Theory Online, you can get credit for half of the Divemaster Final Exam. 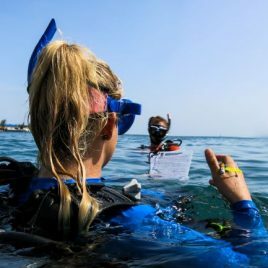 Your PADI Instructor can explain how this works when you meet to schedule knowledge review sessions along with your water skills exercises, workshops and practical assessments. Underwater Vision will provide you with the scuba diving gear you will need for your Divemaster course training. It is highly recommended that you begin to invest in your own scuba equipment as you will require it to work as a professional PADI Divemaster or PADI Instructor. 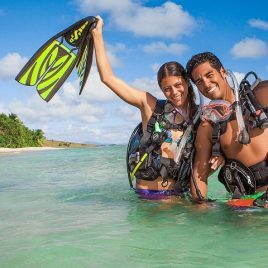 You can purchase basic scuba diving gear in Utila including scuba diving computers and basic accessories such as a dive torch, dive slates, dive knife, compass, dive watches, mask, fins and snorkels. In order to enroll in the PADI Divemaster Course at Underwater Vision in Utila you must be at least 18 years old, be a PADI Advanced Open Water Diver (or qualifying certification from another training organization, be a PADI Rescue Diver (or qualifying certification from another training organization), be a qualified Emergency First Response Primary and Secondary Care responder (or qualifying first aid and CPR training from another organization) course completion within the past 24 months. All of the above courses are available at Underwater Vision. Contact us for course bundle package deals and our Zero to Hero discount! In addition you must have at least 40 logged dives to begin the PADI Divemaster course and 60 for certification. We can help you to achieve the first forty dives with unlimited diving in the week preceding the start of your course. You must also be physically healthy and submit a completed PADI Pro Medical Statement (pdf) signed by a physician within the last 12 months. The medical statement can be done in Utila. Contact Us to book your stay and join the PADI Divemasters in Training Internship Program at Underwater Vision Today!